Automa 2000 specialises in engineering and manufacturing Welding Positioners and welding turntables. They offer a wide range of welding positioners in two lines: Welding Positioners main standard and special. These are the best solution for circumferential or linear Welding Positioners. With maximum acceptable loads between 30 and 33,000 Kg and size up to 7000 mm diameter or 4,000 mm length. All models are made to guarantee reliability and easy operation. 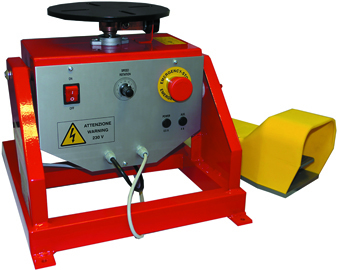 SPS turntable welding positioners (light series) with maximum load capacity from 30 to 200 Kg. SP turntable welding positioners (heavy series) with maximum load capacity from 300 to 8.000 Kg. SBR seam welding positioners for a maximum welding length of 3000 mm and 1000 mm diameter. SR roller positioners; maximum load capacity from 1600 to 33000 Kg. SMB column and boom welding positioners. Max height 7000 mm; max outreach 4000 mm. SCAR modular longitudinal welding positioners. STL welding lathe positioners for 900 mm max diameter and 4000 mm max length. SPC tilting frame positioners; 400 Kg max acceptable load. Automa's engineering team is capable of finding the best solution to meet even the most complex needs. For full machine information, quotations and up to date pricing and availability, contact our sales team on 01952 29080. Click here to view the Automa catalog (without prices).